Banks of all sizes rely on Customer Satisfaction Surveys to better understand their relationships, with most finding a comfortably high percentage of satisfied customers. So why do fewer than thirty percent of the average bank’s customers – including small businesses – actively consider their bank for their next banking product purchase? Because satisfied customers aren’t necessarily loyal customers. 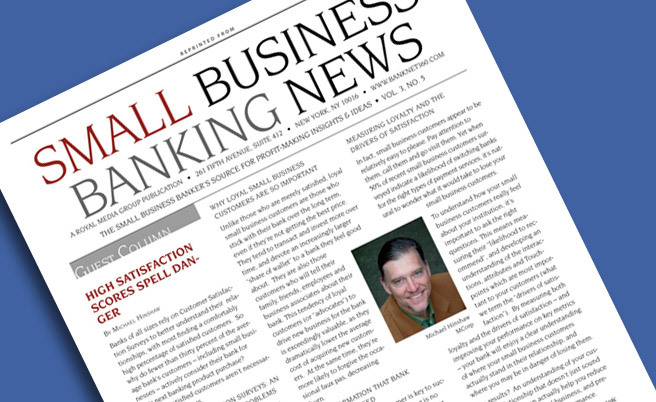 Using satisfaction surveys as a tool, many banks learn how “satisfied” their small business customers are with the relationship, only to find that these measures don’t translate into retention, profit or referral business. Why? The answer is simple. Satisfied customers aren’t necessarily those loyal customers who positively affect retention rates, profitability and top-line growth. In fact, only 30% of the average bank’s customers will consider it for future deposit or credit products, in spite of satisfaction metrics in the 80 to 90% range. This means that small business customers who have high satisfaction but low loyalty scores are both expensive to acquire, and quick to depart. Of those who do leave, fully half do so for bank related reasons. Whether chasing rates or changing due to poor service or a merger, these otherwise satisfied customers are costing your bank a great deal. Time and again, 60 to 80% of lost customers surveyed have claimed to be “satisfied” or “very satisfied,” just prior to defecting. Unlike those who are merely satisfied, loyal small business customers are those who stick with their bank over the long term, even if they’re not getting the best price. They tend to transact and invest more over time, and devote an increasingly larger “share of wallet” to a bank they feel good about. They are also those customers who will tell their family, friends, employees and business associates about their bank. This tendency of loyal customers (or “advocates”) to drive new business for the bank is exceedingly valuable, as they dramatically lower the average cost of acquiring new customers. At the same time, they’re more likely to forgive the occasional faux pas, decreasing churn. Understanding your customer is key to success in any business, and banking is no exception. In fact, close to 75% of senior Financial Services marketing executives believe that more accurate customer opinion, experience and needs information would improve overall marketing and branding effectiveness. What activities the bank can undertake to positively influence customer loyalty. In fact, small business customers appear to be relatively easy to please. Pay attention to them, call them and go visit them. Yet when 50% of recent small business customers surveyed indicate a likelihood of switching banks for the right types of payment services, it’s natural to wonder what it would take to lose your small business customers. To understand how your small business customers really feel about your institution, it’s important to ask the right questions. This means measuring their “likelihood to recommend”, and developing an understanding of the interactions, attributes and Touchpoints which are most important to your customers (what we term the “drivers of satisfaction”). By measuring both loyalty and the drivers of satisfaction – and improving your performance on key metrics – your bank will enjoy a clear understanding of where your small business customers actually stand in their relationship, and where you may be in danger of losing them. The results? An understanding of your customer relationship that doesn’t just sound good, but that can actually help you reduce churn, increase referral business, and predict future relationship performance. Michael Hinshaw, managing partner of strategic brand and marketing consultancy MCorp., has more than 20 years of experience in marketing, brand, and management consulting, with emphasis on business-to-business and financial services. MCorp. is the developer of Loyalty Mapping, a method for measuring customer satisfaction and loyalty. Its clients include Comerica Bank, Western Financial Bank, GE Financial Services, and Wells Fargo & Co.